HP ENVY 15-U493cl x360 is a 15.6 inch 2-in-1 convertible computer around a 360 degree rotating hinge with a Full HD IPS display, backlit keyboard, 6th generation i7 processor, generous amounts of hard drive and memory and long battery life. This is a certified and refurbished unit that looks and works like brand new, that is tested, cleaned, inspected and put in generic packaging and comes with a 90-day warranty. It has some pretty decent high end specs including the Skylake ultra low voltage dual core Intel i7-6500U processor (4MB cache) at 2.5GHz up to 3.1GHz speeds with a Passmark score of 4327, 12GB DDR3L SDRAM at 1600MHz on two DIMMs, 1TB Serial ATA hard drive at 5400rpm spindle speed and Windows 10 64-bit operating system. It is fast and powerful enough for both the daily and more complex tasks except for gaming as it lacks a dedicated graphics card. 15.6 inch diagonal WLED-backlit touch display with IPS panel has the 1920 x 1080 pixel resolution for very clear images with vibrant colours and 178 degree viewing angles especially for when you’re sharing your screen with others in different modes. Intel HD 520 integrated graphics card with a similar performance level of GeForce 820M for decent multimedia capability and lets you run the latest games at low settings only. Bang & Olufsen Audio delivers great immersive sound that is quite clear at high volume through its dual speakers for songs, videos or games. So you’re not buying this machine for advanced gaming purposes but more for its general processing power and portability along with longer battery life up to 8 hours and 45 minutes from its 3-cell 48WH lithium ion battery- but more like 6 to 7 hours in practice. As an Energy Star certified and Epeat Silver registered product, with an ultra low voltage processor and a Thermal Design Power of 15 watts it is able to offer the longer battery life. 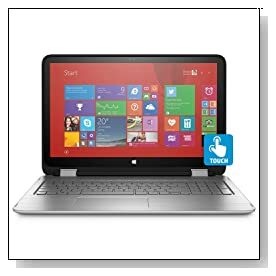 Silver HP Envy 15-U493cl looks and feels premium and great quality, weighs 5.29 pounds and measures 15.04 x 9.84 x 0.94 inches- not the slimmest or lightest convertible machine out there but is still portable. Keyboard is backlit and full-size with also 10 key numpad and responsive HP Imagepad with multi-touch gesture support. Connectivity options include the 802.11ac wireless + Bluetooth (2x2), a USB 2.0 port, 2 x USB 3.0 ports (1 HP USB Boost), an HDMI output, Ethernet with RJ-45 connector and a Headphone / Microphone combo (there is no DVD Optical Drive). Price to performance and features is quite good and is a great looking machine with the added advantage of being used both as a laptop and tablet and in other modes including tent and stand. 5400rpm speed of hard drive is a bit low but they had to cut on costs somewhere as you’re given a lot in terms of tech specs for how much this costs. HP is one of the major computer manufacturers in the world and makes good quality computers but we are aware of some of the screen issues of x360 models reported but these seem to be fixed since then. 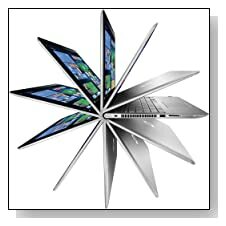 It comes with a year limited hardware warranty by HP with toll-free support from HP Customer Support.